There are several important differences in mirroring; it's best to start from a clean slate on all slaves, using this documentation. If you're not willing to do that, you may be able to use the older, more detailed, documentation here to manage the migration. However, I cannot support that (mainly due to lack of time). Mirroring is simple: you have one "master" server and one or more "slave" servers. The slaves get updates only from the master; to the rest of the world they are at best read-only. In the following picture, each box (A, B, C, ...) is a repo. The master server for a repo is colored red, slaves are green. 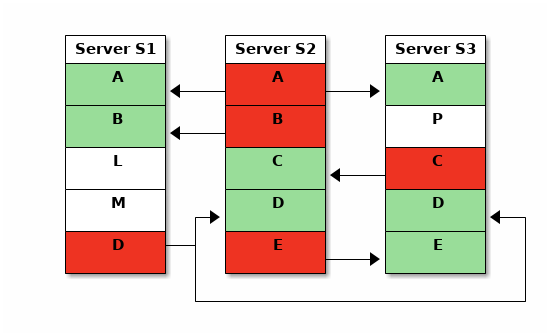 Users only push to a master server (red), and the master server then does a git push --mirror to the slaves. The arrows show this mirror push. Different masters and sets of slaves for different repos. Use the server closest to most of its developers as the master for that repo. Mirror a repo to only some of the servers. Have repos that are purely local to a server (not mirrored at all). Push to a slave on demand or via cron (helps deal with bandwidth or connectivity constraints). All this is possible whether or not the gitolite-admin repo is mirrored -- that is, all servers have the exact same gitolite-admin repo or not. Pushes to a slave can be transparently forwarded to the real master. Your developers need not worry about where a repo's master is -- they just write to their local mirror for all repos, even if their local mirror is only a slave for some. Mirroring by itself will never create a repo on a slave; it has to exist and be prepared to receive updates from the master. The simplest way to ensure your repos exist on the slaves also is to mirror the special gitolite-admin repo as well, and this is what most sites do. There is limited support for auto-creating wild card repos and sending 'perms' info across, with the following caveats at present. (Some of this text won't make sense unless you know what those features are). WARNING: it does NOT make sense to mirror wild repos in setups where the authentication data is not the same (i.e., where "alice" on the master and "alice" on a slave maybe totally different people). This has only been minimally tested. For example, complex setups or asymmetric configs on master and slave, etc. have NOT been tested. Using 'perms' on a slave is allowed but will neither propagate nor persist. They will be overwritten by whatever perms the master has (even if it is an empty set) on the next 'git push'. As with lots of extra features in gitolite, smart http support is not on my radar. Don't ask. Mirroring is only for git repos. Ancillary files like gl-creator and gl-perms in the repo directory are not mirrored; you must do that separately. Files in the admin directory (like log files) are also not mirrored. If you ever do a bypass push, mirroring will not work. Mirroring checks also will not work -- for example, you can push to a slave, which is not usually a good idea. So don't bypass gitolite if the repo is mirrored! From v3.5.3 on, gitolite uses an asynchronous push to the slaves, so that the main push returns immediately, without waiting for the slave pushes to complete. Keep this in mind if you're writing scripts that do a push, and then read one of the slaves immediately -- you will need to add a few seconds of sleep in your script. This is in two parts: the initial setup and the rc file, followed by the conf file settings and syntax. Install gitolite normally. Make clones of the server's 'gitolite-admin' repo on your workstation so you can admin them all from one place. Give the server a short, simple, "hostname" and set the HOSTNAME in the rc file (i.e., ~/.gitolite.rc on the server) to this name, for example 'mars'. Note: this has nothing to do with the hostname of the server in networking or DNS terms, or in OS terms. This is internal to gitolite. Run ssh-keygen if needed and get an ssh key pair for the server. Copy the public key to a common area (accessible to your workstation for copying) and name it after the host, but with 'server-' prefixed. For example, the pubkey for server 'mars' must be stored as 'server-mars.pub'. Don't forget to push the changes! You may have guessed that the prefix 'server-' is special, and distinguishes a human user from a mirroring peer. Create "host" aliases to refer to all other machines. See here for what/how. The host alias for a host (in all other machines' ~/.ssh/config files) MUST be the same as the HOSTNAME in the referred host's ~/.gitolite.rc. Gitolite mirroring requires this consistency in naming; things will NOT work otherwise. Normally you should be able to build one common file and append it to all the servers' ~/.ssh/config files. # the response MUST start with "hello, server-mars..."
Note the exact syntax used; variations like "ssh git@phobos.example.com info" are NOT sufficient. That is why you need the ssh host aliases. Check this command from everywhere to everywhere else, and make sure you get expected results. Do NOT proceed otherwise. When that is all done and tested, enable mirroring by going through the rc file and uncommenting all the lines mentioning Mirroring. If you wish to allow your users to run the mirror command remotely (usually not required), you need to enable it just like any other command that is not enabled by default; see gitolite commands for how. Mirroring is defined by the following options. You can have different settings for different repos, and of course some repos may not have any mirror options at all -- they are then purely local. The first line is easy, since a repo can have only one master. The second is a space separated list of hosts that are all slaves. You can have several slave lists, as long as the config key starts with 'mirror.slaves' and is unique. For example. Do not repeat a key; then only the last line for that key will be effective. Sometimes you don't want a repo to be mirrored automatically (as soon as someone pushes to the master) to all the slaves. For whatever reasons, you have some slaves for whom you would like to trigger the sync later (and you don't mind the fact that those slaves are out of sync until then). Except for the addition of a .nosync just after slaves, all the other rules are the same as before. Since mirror pushes happen asynchronously (i.e, the user who originally pushed does not have to wait for the mirrors to be synced), any mirror push failures are not immediately visible to a human being, although you will find them if you look in gitolite's log files. Note: since only a successful push can clear the error status, it follows that if a mirror push failed due to an invalid hostname, that status file will need to be manually deleted from the server. Look in the bare repo directory on the server, for one or more files whose names start with 'gl-slave' and delete the appropriate one. Therefore, when the output of the mirror push to some slave contains the word "fatal", gitolite saves the output. This saved output is printed to STDERR when any user attempts to clone/fetch/push the repo on the master server for that repo. The hope is that someone will alert an admin to look at the problem. This will continue to happen until the error condition is cleared (i.e., a successful mirror push happens to that specific slave). If you don't want these unexpected reports confusing users (or programs! ), simply create a new rc variable called HUSH_MIRROR_STATUS and set it to 1. (If you're not sure where in the rc file this should go, I suggest putting it right after the HOSTNAME variable). You can see the mirror status of any repo using the 'mirror status' command; the command line help for the mirror command ('gitolite mirror -h' or 'ssh git@host mirror -h') has details. You can use the gitolite mirror push command on a master to manually synchronise any of its slaves. Try it with -h to get usage info. This command can also be run remotely; run ssh git@host mirror -h for details. Note: if your version of the mirror command does not support 'list slaves', use gitolite git-config -r reponame mirror.slave | cut -f3 instead. Please read carefully; there are security implications if you enable this for mirrors NOT under your control. Normally, a master, (and only a master), pushes to a slave, and the slaves are "read-only" to the users. Gitolite allows a slave to receive pushes from a user and transparently redirect them to the master. This simplifies things for users in complex setups, letting them use their local mirror for both fetch and push access to all repos. The first syntax trusts all valid slaves to redirect user pushes, while the second one trusts only some slaves. This only works for ssh-based setups; you cannot use this feature in http mode. Authentication happens on the slave, but authorisation is on the master. The master is trusting the slave to authenticate the user correctly, even though the actual push is going to the master. This means that user alice on the slave must be guaranteed to be the same as user alice on the master. The part of the authorisation that happens before passing control to git-receive-pack (see access rules) will happen on the slave as well. You cannot redirect gitolite commands (like perms, etc). (See include for more on the 'include' command). Moving only some repos (other than the gitolite-admin repo) to a different master is easy. Just make the change in the gitolite.conf file, add, commit, and push. Even for the gitolite-admin repo, if the current master is ok, it's the same thing; just make the change and push to the current master. Subsequent pushes will go to the new master, of course. But if the current master is already dead, there's a bit of a catch-22. You can't push to the master because it is dead, and you can't push to any slave because they won't accept updates from anywhere but the server they think is the master. Edit ~/.gitolite/conf/gitolite.conf to change the master and slave options for the gitolite-admin repo. Now clone the admin repo from the new master to your workstation, change the options for the rest of the repos (if needed), then add/commit/push. and you then accidentally removed phobos and pushed. This is basically saying, "yes I see that repo in the config, but I (phobos) am neither the master nor one of the slaves for it, so please don't ask me about it!". You're basically locked out of phobos now. edit ~/.gitolite/conf/gitolite.conf to fix the mirroring options for the gitolite-admin repo.